Exiting right at the second interchange at the turnoff for Byurakan from the Gyumri highway, on the left is a bird's wing monument to the heroes of the battle for Van. The monument is built on the site of the Bronze Age graveyard of Verin Naver, with substantial chamber tombs of coarse boulders surrounded by stone rings and covered with a mound. 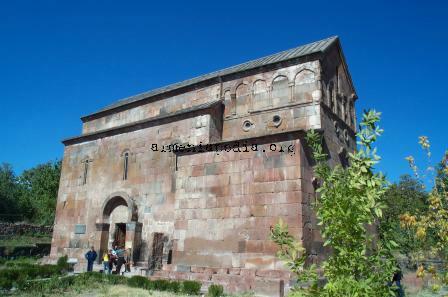 In Byurakan (3930 p, Bed & Breakfast) is the important S. Hovhannes basilican church. About 1 km NE (ask directions) is the Artavazik church of 7th c., with a 13th c. khachkar. A side road goes W to just below Orgov and Tegher (see below). 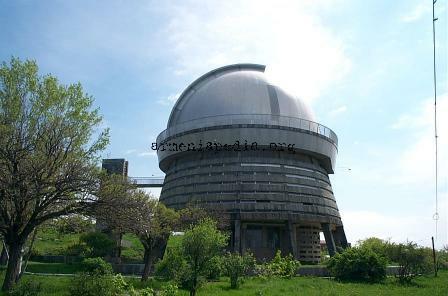 Byurakan Observatory =40= is known by astronomists around the world. It was headed by Viktor Hambartsumian who was also the president of the International Astrophysicist Organization. During his time at the observatory, Viktor developed theories of young star clusters, and computing the mass ejected from nova stars. The observatory allows visitors and will give a tour and slide show in Armenian, Russian, and sometimes English to groups. Uphill from Byurakan, Antarut (205 p, until 1949 Inaklu, founded in the 2nd half of the 19th c.) has early khachkars. This page was last edited on 14 July 2016, at 20:46.